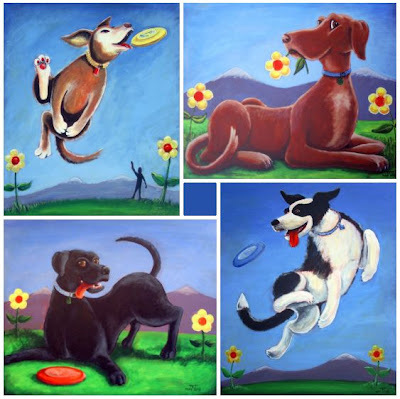 "Hey David, wanted to send our sincere thanks for painting four fantastic interpretations of our pups. Each one of them is unique and really captures their essence. To be honest, it's not often that one can expect such great service, especially over such a long distance, and over the past four months, working with you on these paintings has been fun and enjoyable." The above comment is part of an email I received from Peter and Amanda after they received the final three of their four commissioned paintings of their family pet dogs (see the paintings above). Whilst I have always offered commissioned art as a service through my Art Time Productions web site it is not something that I actively promote here on my TET site. However people occasionally are inspired by both my cat and dog paintings and ask if I would consider painting their pet in my style (which is what happened with Peter and Amanda). For those of you interested in the idea of commissioning your own piece of art I thought this is a good opportunity to describe the process, given that it's the same whether you live in the same country as me (Australia) or some other country that I can't get to by bus. Firstly, I don't paint realistically or paint portraits. If that's what you're after then I'm the wrong artist for the job. What I like to do is to try and capture personality and character within a cartoon-like image that says more about the subject than just a straight portrait might. Modern technology means that all communication can be done online, usually via email. You initiate a commissioned work by contacting me, suggesting what it is you have in mind for a painting then I'll send you a quote. My prices are based on the size of the canvas you want, which can be any size up to 90 x 90cm (35" x 35"). In the case of painting your pets I ask for some good photos of them including a good face shot and a good side view (for profile and markings). Photos of your pets in action are good too. I'll usually suggest you upload them to a photo-sharing site like Flickr so that you can upload as many photos as you wish and I don't have to deal with multiple email attachments and large file sizes. Along with that I'll ask for a couple of paragraphs describing your pets personality and the things they like to do (depending upon how specific your suggestion was on what you wanted painting - some people like me to come up with ideas of what their pet might be doing in the painting). 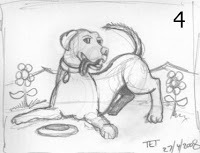 Once I have all that I'll start sketching my ideas and email three or four back to you to choose from - just like I did with Peter's dog, Lucy - see the sketches on the right. In this case Peter had described a specific idea to have Lucy grounded with a Frisbee on the grass nearby. My idea was to make it still look like a fun image with Lucy kind of waiting for the Frisbee to be thrown again. Peter liked the third sketch but felt the face from sketch two looked more like Lucy. Rather than redraw a new version I simply photo-shopped the head from sketch two onto sketch three to get sketch four (see sketch 4 bottom right). Peter liked this sketch so that's what the painting was based upon. You may have noticed that I haven't talked about colours. That's because I don't plan my colour schemes too much, however if you want a particular colour to be dominant in the overall image than I usually ask that you let me know. Otherwise you won't see the colour scheme I have in mind until the painting is virtually finished. Bearing in mind that I will try to match the colours of your pet to the best of my ability and you won't get any psychodelic backgrounds unless that is what you've asked for (sky will be blue and grass will be green etc.). Once the painting is finished I'll email you a scanned image for your approval. At this time you can ask for small changes - within reason. For example, with Lucy I had trouble getting her facial expression just right (see image below). Peter and I emailed back and forth a bit on this until he felt Lucy's face was to his and Amanda's liking. When everything is just how you want it the final step is payment and postage. I don't ask for any upfront payment however once it's finished I expect payment plus the cost of postage before the artwork is sent. If you live in Australia then there are a few options for how to pay me however my preferred method is via PayPal - which is the only method available to international clients. I'll usually send a PayPal invoice via email. You simply pay the invoice and I'll put your artwork in the post. For international clients I can send your artwork via registered mail and I can insure it too however you will have to cover all the extra costs of that. Artworks to overseas destinations are sent via Air Mail and usually take up to ten business days to arrive. Hopefully this longish article has demystified the process of commissioning a piece of art from me. If you live outside Australia don't let that put you off. I'm trying to build my reputation globally so I have no intention of not delivering your artwork to you. As well PayPal makes the conversion process between currencies a snap. I can invoice you in Australian dollars and you can pay the equivalent in your own countries currency. You may also like to read my Testimonials from people who have either commissioned an artwork or purchased either one of my own original artworks or something from my Gallery Shop.